Never has this been more clear than on Niamh’s (pronounced “Neeve”) latest album, Heart’s Desire (Green Linnet, 2002), produced by Dennis Cahill. As with her two previous releases, she furthers the tradition of Irish song with heartfelt delivery and unadorned settings. The collection of songs is drawn from both traditional sources and modern writers, including Mark Knopfler and Andy Irvine. Heart’s Desire has received glowing reviews, and named “Celtic Album of the Year” by the Association for Independent Music (AFIM). Born and raised in Dublin, Niamh and her sister learned to love traditional Irish singing and harmonizing from their father, Jack Parsons, to whom Niamh dedicates Heart’s Desire. “Daddy had a beautiful voice,” she says, “and a great ear for a good song.” Her mother was also a singer and a set dancer from Co. Clare. The family would often join in song at the local Dublin singers’ club, to which Niamh still attends. Throughout her career, Niamh has performed with a wide variety of artists, and has appeared at nearly every prestigious folk festival on either side of the Atlantic. As a member of the traditional Irish band Arcady (led by De Dannan’s Johnny “Ringo” McDonagh), she is featured on the group’s AFIM-awarded CD Many Happy Returns. She appeared before President Clinton and Irish Prime Minister Bertie Ahern in Washington, joined Grammy Award winner Paul Winter for an album and a summer concert in New York, and performed on A Prairie Home Companion when the show broadcast live from Dublin. Niamh’s recording career began with The Loose Connections, a band of top-notch Belfast musicians she formed with songwriter and bass-player Dee Moore. The band recorded two albums of contemporary and traditional material together. Their debut recording, Loosely Connected (Greentrax, 1992; Green Linnet, 1995) met with the highest of praise. A beautiful mix of traditional Irish and contemporary songs, it featured the memorable “Tinkerman’s Daughter” and featured Brian Kennedy, piper John McSherry (Lúnasa, Coolfin), and accordionist Alan Kelly. The Loose Connections’ second album, Loosen Up (Green Linnet, 1997) was another buoyant mix of originals and well-chosen contemporary ballads, like the gorgeous “Cloinhinne Winds” and Tom Waits’ “The Briar and the Rose,” a powerful a cappella duet with Fran McPhail of the Voice Squad. Once again the album featured first-class musicians, including guitarist Gavin Ralston (Mike Scott, Sharon Shannon) and Kilkenny accordion player Mick McAuley (now with Solas). Keeping in form, Niamh’s next CD In My Prime (Green Linnet 2000) was another collection of mostly traditional material, and again received widespread praise. Folk Roots named it one of the top albums of the year and The Irish Voice called the album “a must-have disc for lovers of Irish song.” It also saw the emergence of Niamh’s new accompanist, talented young guitarist Graham Dunne. The album was nominated for Album of the Year by BBC Radio 2 (UK) and the Association for Independent Music (US). With Heart’s Desire the newest addition, it is a body of work that has proven Niamh Parsons one of the premier vocalists of her time and a keeper of the flame in Irish traditional song. 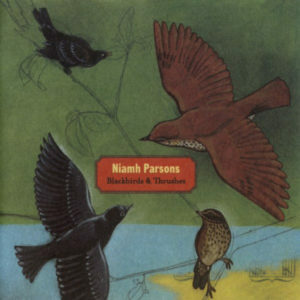 “Irish singer Niamh Parsons proves by this CD that she’s still very much indeed in her prime….She’s done it again here with, with more lovely songs from Ireland and beyond. But it’s not just the beauty of the songs that makes this CD, it’s what Parsons does with each song. She breathes sweet life – and sometimes bittersweet sorrow – into each word as she lifts the lyrics off the page and sets them flying.” – Pulse!